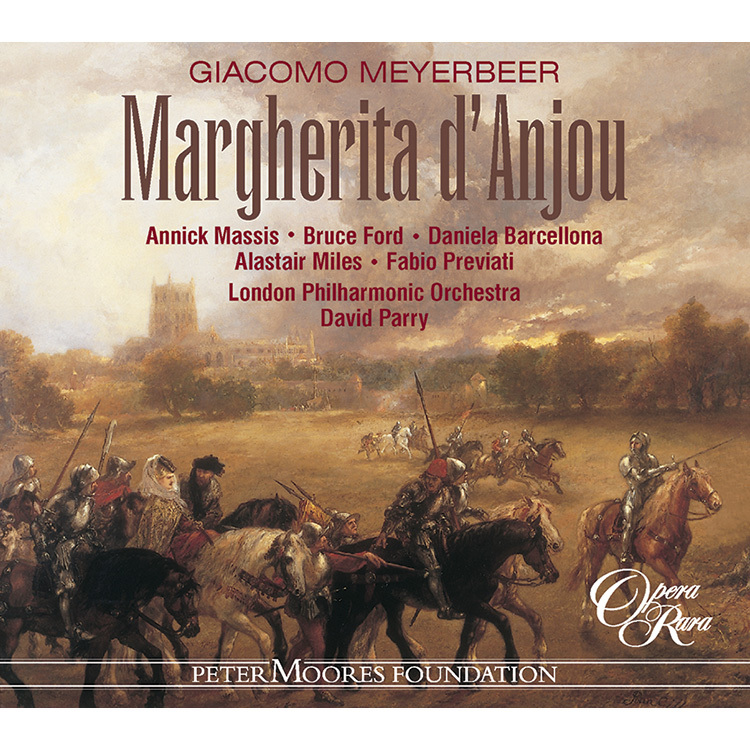 Margherita d’Anjou is the fourth of Meyerbeer’s six Italian operas. 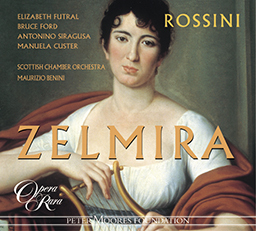 Although he is often accused of imitating Rossini, this engaging opera shows how Meyerbeer uses the musical conventions of the time to forge his own musical style. 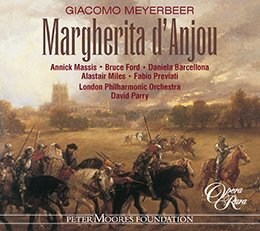 Margherita d’Anjou is the fourth of Meyerbeer’s six Italian operas. Although he is often accused of imitating Rossini, this engaging opera shows how Meyerbeer uses the musical conventions of the time to forge his own musical style. With this score he challenged the orchestra of La Scala, one of the best in Italy, to its technical limits. New and exciting effects are heard in the orchestration of Margherita d’Anjou – ideas that would surface again in Dinorah, almost 40 years later. For this recording Opera Rara fields another extraordinary cast with the gifted soprano Annick Massis in the title role. Bruce Ford as Laverenne gives a remarkable performance and the young Italian mezzo-soprano, Daniela Barcellona, is exemplary in the role of Isaura. Alastair Miles (Carlo), Fabio Previati (Michele), and Pauls Putnins (Duke of Gloucester) are all basses par excellence. 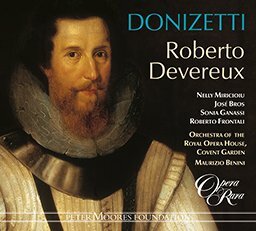 This highly entertaining opera, so easy on the ear, is helped by the performances of first-rate singers, the fine playing of the London Philharmonic Orchestra and the virtuoso conducting of David Parry. 02 Margherita d’Anjou: Act I scena I: Coro: Quattro! Cinque! 05 Margherita d’Anjou: Act I scena II: Coro: Ma qual suono da lunge si ascolta? 07 Margherita d’Anjou: Act I scena III: Recitative: Profittiam del tumulto ? – scena IV: Si signori ? 16 Margherita d’Anjou: Act I scena VI: Allegro moderato: Per noi di gloria gia splende un raggio ? 21 Margherita d’Anjou: Act I scena VII: Allegro: Secondiam si dolce istinto – scena VIII: Buono, buono davvero ? 23 Margherita d’Anjou: Act I scena IX: Scena: Eccovi, o prodi ? 26 Margherita d’Anjou: Act I scena XIII: Finale Primo: Fra quest’ombre, e queste rupi – scena XIV: Zitto, zitto ? 27 Margherita d’Anjou: Act I scena XV: Finale Primo: Ciel m’assisti ? – scena XVI: Arreste ? 28 Margherita d’Anjou: Act I scena XVI: Quintetto: Crudel cimento! 30 Margherita d’Anjou: Act I scena XVI: Stretta: Ma piu d’appresso squilla la tromba – Act II scena I: Voliamo amici – scena II: Carlo, io ti vedo alfin? 31 Margherita d’Anjou: Act II scena IV: Coro campestre: Che bell’alba! 33 Margherita d’Anjou: Act II scena V: Aria: Che mai giova il serto? 41 Margherita d’Anjou: Act II scena X: Terzetto: Pensa e guarda, amico, all’erta! 42 Margherita d’Anjou: Act II scena XI: Sestetto: Ecco, Alterzza, a voi davanti – scena XII: Ferma il passo! 43 Margherita d’Anjou: Act II scena XII: Andante sostenuto: Oh! Rabbia! Oh furore! – scena XIII: T’arresta; ove vai? 45 Margherita d’Anjou: Act II scena XIV: Recitative: Bravi, bravi, amiconi! – scena XV: Che diamine, signora? An encampment on the bank of a river. The army of Margherita d’Anjou, widow of Henry VI, led by Orner and Bellapunta, drink to their queen’s honour. Carlo Belmonte, formerly one of Margherita’s generals, now banished and currently in the employ of Richard, Duke of Glocester, enters the camp. As he mingles with the soldiers and peasants Margherita enters with her retinue and addresses her troops, praising their support and promising to reward their loyalty. Margherita’s excitement mounts as joyous military music in the distance promises the arrival of the Duc de Lavarenne. She goes to meet him. Michele arrives accompanied by Eugene (Isaura – Lavarenne’s wife – in disguise), who sings of her love for her husband while Michele pours scorn on her emotions. Isaura reveals Lavarenne’s love for Margherita, both of whom arrive with their entourage. Lavarenne announces an attack on Glocester’s camp for the following day and predicts victory. Isaura despairs of her position and Michele attempts to sooth her. Isaura (still disguised as Eugenio) and Michele are presented to Margherita, who immediately appoints ‘Eugenio’ as companion to her son. The interior of a tent. Lavarenne has resolved to reveal to the queen the secret of his marriage. Isaura enters his tent as he is writing his confessional letter; he instructs Isaura to give the letter to the queen if he does not survive the coming day’s battle. A cannon shot is followed by distant trumpets indicating soldiers outside the encampment; Laverenne tells Margherita that they are men of the Duke of Somerset come to assist, but Carlo knows that they are in fact Glocester’s men that he has alerted. To the assembled throng Margherita praises the courage of Laverenne as she presents young Edward, the heir to the throne. The crowd cheer their future king. A dense forest. Carlo returns to the Highlanders’ camp in the forest, and reports the defeat of Margherita’s and Lavarenne’s army. Michele is apprehended by Carlo’s men and appointed doctor to the Highlanders. In the dark, Lavarenne, Isaura and Michele appear, one by one, among the rocks. The Highlanders lay a trap for Margherita who is also wandering in the forest; they ambush her. Just as they are about to assassinate her Carlo reveals himself to Margherita and, despite her treatment of him, vows his allegiance, and instructs the Highlanders to do likewise. Carlo proposes that his Highlanders should lure the enemy away while all make their way back to the camp; Margherita, disguised as a peasant woman will stay in Carlo’s cottage in the forest. As distant trumpets reveal the approach of Glocester’s army, all pray that heaven will protect them in this moment of danger. A small village with several cottages, near the forest. It is broad daylight. Highland men and women, enjoying the beautiful day, wander off into the countryside. From the cottage where she is hiding Margherita, in disguise, appears. She reflects on recent events but returns to her cottage when an approaching soldier is spotted by the Highlanders. Isaura arrives and delivers Lavarenne’s letter and reveals her true identify to Margherita. The queen, although shocked, is wise enough to see that Isaura is devoted to Laverenne. Inside a tent, as in Act I. Lavarenne knows he must choose between the two women in his life. Although he is fiercely loyal to Margherita, he realises he still loves Isaura. Interior of a cottage. Michele, now the cook, sends Carlo to answer the loud knocking on the door. It is Richard, Duke of Glocester, in search of Margherita and her son. He interrogates Michele and is suspicious of the latter’s ‘wife’ whom he demands to see. Margherita is brought in and Glocester recognises her. Just as he threatens her, Lavarenne and a detachment of French soldiers enter, but Glocester grabs Margherita’s son and, threatening to kill him, attempts to use him as a means of escape. Michele has, in the meantime, absented himself and now returns with some Highlanders who disarm Glocester. A village, as before. Bellapunta congratulates his officers on their victory. Michele attempts once more to convince Isaura that she will regain Lavarenne. Isaura is uncertain but Margherita comes in and presents the Duke to Isaura. Laverenne asks forgiveness and Isaura expresses her happiness as the opera closes with husband and wife reunited. Un accampamento sulle rive di un fiume. L’esercito di Margherita d’Anjou, vedova di Enrico VI, guidato da Orner e Bellapunta, brinda alla propria regina. Entra Carlo Belmonte, un tempo generale di Margherita, ma poi esiliato e attualmente al servizio di Riccardo, duca di Glocester, e si confonde tra soldati e contadini. Quindi fa il suo ingresso Margherita con il suo seguito e si rivolge alle truppe, elogiando il loro sostegno e promettendo di ricompensare la loro fedeltà. Il suo entusiasmo aumenta quando una vivace musica militare in lontananza preannuncia l’arrivo del duca di Lavarenne. La regina va a incontrarlo. Arriva Michele, accompagnato da Isaura, moglie di Lavarenne, che si è travestita da uomo e si fa chiamare Eugenio. La donna dichiara il proprio amore per il marito, mentre Michele si prende gioco delle sue emozioni, e rivela che Lavarenne ama Margherita proprio prima che questi ultimi entrino in scena, ciascuno con il proprio seguito. Lavarenne annuncia un attacco contro il campo di Glocester per il giorno successivo e prevede la vittoria. Isaura si dispera e Michele tenta di confortarla. Poi entrambi vengono presentati a Margherita, che immediatamente nomina ‘Eugenio’ compagno di suo figlio. Interno di una tenda. Lavarenne ha deciso di rivelare alla regina il segreto delle proprie nozze. Isaura entra nella tenda e lo vede mentre scrive una lettera di confessione; il duca le ordina di consegnare la lettera alla regina nel caso dovesse rimanere ucciso durante la battaglia del giorno successivo. Un colpo di cannone, seguito da squilli di tromba in lontananza, rivela una presenza militare al di fuori dell’accampamento; Lavarenne dice a Margherita che si tratta dei rinforzi inviati dal duca di Somerset, ma Carlo sa che si tratta in realtà dei soldati di Glocester da lui avvisati. Davanti alla folla riunita, Margherita esalta il coraggio di Lavarenne e presenta il giovane erede al trono Edoardo. La folla applaude il suo futuro re. Una fitta foresta. Carlo ritorna all’accampamento dei montanari scozzesi nella foresta e comunica la sconfitta dell’esercito di Margherita e Lavarenne. Michele viene catturato dagli uomini di Carlo e nominato medico degli scozzesi. Nell’oscurità compaiono Lavarenne, Isaura e Michele, uno dopo l’altro, tra le rocce. I montanari tendono un tranello a Margherita che si aggira anche lei per la foresta, la catturano con un agguato e stanno per ucciderla quando Carlo le rivela la propria identità. Dimenticando il trattamento che gli è stato riserbato dalla regina, le giura fedeltà e ordina agli scozzesi di fare altrettanto. Poi ordina ai suoi di sviare l’attenzione del nemico, allontanandolo, mentre tutti ritornano all’accampamento; Margherita, vestita da contadina, rimarrà nella casa di Carlo nella foresta. Mentre trombe in lontananza rivelano l’avvicinarsi dell’esercito di Glocester, tutti invocano la protezione divina in questo momento di pericolo. La campagna scozzese, come nel primo atto. Poco prima dell’alba. Tra un gruppo di soldati assetati di vendetta compare Glocester, furibondo perché Margherita è ancora in libertà, e ordina di incendiare l’intera foresta. Carlo, rinnovata la sua fedeltà alla regina, tenta di ingannarlo sui movimenti della donna. Un piccolo villaggio con diverse casette sul limitare della foresta. È giorno. I montanari scozzesi vanno e vengono, godendosi la bella giornata. Dalla casa in cui si nasconde esce Margherita, travestita, e riflette su quanto le è accaduto, ma rientra al coperto quando i montanari vedono un soldato avvicinarsi. Arriva Isaura che consegna la lettera di Lavarenne a Margherita e le rivela la sua vera identità. Per quanto sconvolta, la regina si rende conto che Isaura è innamorata di Lavarenne. Interno di una tenda, come nell’atto I. Lavarenne sa che deve scegliere tra le due donne della sua vita. Nonostante la propria ardente fedeltà a Margherita, sa di amare ancora Isaura. Interno di una casa. Nella sua nuova veste di cuoco, Michele manda Carlo ad aprire la porta. Qualcuno bussa forte: si tratta di Riccardo, duca di Glocester, in cerca di Margherita e di suo figlio. Interrogato Michele, si insospettisce sull’identità di sua “moglie” e pretende di vederla. Viene condotta avanti Margherita e Glocester la riconosce. Mentre la minaccia, entrano Lavarenne e un distaccamento di soldati francesi, ma Glocester si fa scudo con il figlio di Margherita e, minacciando di ucciderlo, tenta di fuggire. Nel frattempo Michele si è allontanato e adesso ritorna con alcuni montanari scozzesi che disarmano Glocester. Villaggio come prima. Bellapunta si congratula con i suoi ufficiali per la vittoria. Michele tenta ancora una volta di rassicurare Isaura: riuscirà a riconquistare Lavarenne. La donna è incredula, ma entra Margherita e le offre il marito. Lavarenne le chiede perdono e Isaura esprime la propria felicità mentre l’opera si conclude con la riunione dei due sposi. Campement au bord d’un fleuve. L’armée de la veuve d’Henri VI, Margherita d’Anjou, et ses généraux, Orner et Bellapunta, boivent en l’honneur de leur reine. Carlo Belmonte, ancien général de Margherita qui, après avoir été banni est passé au service du duc de Glocester, Richard, fait son entrée dans le camp. Il se mêle aux soldats et aux paysans tandis que Margherita arrive avec sa suite et, s’adressant aux troupes, les remercie de leur soutien puis leur promet de récompenser leur loyauté. Le son d’une fanfare militaire annonçant le retour du duc de Lavarenne se fait alors entendre au loin. A mesure qu’il se rapproche la joie de Margherita va croissante et elle se porte à ses devants. Michele arrive accompagné d’Eugenio (en fait, la femme de Lavarenne, Isaura, sous un déguisement), qui chante son amour pour son époux – sentiment pour lequel Michele n’a que mépris. Isaura révèle l’amour de Lavarenne pour Margherita, au moment où ceux-ci font leur entrée avec leur entourage. Lavarenne annonce pour le lendemain une attaque contre le camp de Glocester et prédit la victoire. Michele tente de consoler Isaura qui désespère. Michele et Isaura (toujours déguisée en Eugenio) sont présentés à Margherita, qui mande immédiatement « Eugenio » auprès de son fils comme compagnon. Intérieur d’une tente. Lavarenne a décidé de révéler à la reine son mariage secret. Lorsqu’Isaura entre dans sa tente, elle le trouve en train de rédiger une lettre de confession et il lui demande, au cas où il perdrait la vie durant la bataille du lendemain, de remettre cette lettre à la reine. Un coup de canon puis, au loin, l’éclat de trompettes indiquent la présence de soldats autour du camp. Lavarenne explique à Margherita que ce sont les hommes du duc de Somerset venus à la rescousse, mais Carlo Belmonte, lui, sait bien qu’il s’agit en fait des hommes de Glocester alertés par ses soins. Devant ses sujets rassemblés, Margherita loue le courage de Lavarenne avant de les inviter à saluer le jeune Edward, héritier du trône. La foule acclame son futur roi. Épaisse forêt. Carlo retourne au camp des Highlanders dans la forêt pour leur annoncer la défaite de l’armée de Margherita et de Lavarenne. Michele est appréhendé par les hommes de Carlo et mis au service des Highlanders comme médecin. Malgré l’obscurité, on voit apparaître Lavarenne, Isaura et Michele parmi les rochers. Les Highlanders tendent une embuscade à Margherita qui, elle aussi, erre dans la forêt, et la capturent. Carlo intervient alors pour empêcher qu’on l’assassine et, malgré la manière dont elle l’a traité, lui fait serment d’allégeance et appelle les Highlanders à faire de même. Carlo suggère aux Highlanders de créer une diversion pendant que chacun rentre au camp. Margherita, déguisée en paysanne, se cachera chez Carlo dans la forêt. Alors que retentissent au loin les trompettes annonçant l’approche de l’armée de Glocester, tous se mettent à prier Dieu de les protéger du danger qui les menace. La campagne écossaise, comme à l’acte I, juste avant l’aube. Des soldats piaffant d’impatience parlent de revanche au moment où Glocester fait son apparition. Furieux de savoir Margherita toujours en liberté, il ordonne à ses hommes de brûler la forêt entière. Carlo, désormais fidèle à la reine, tente de lancer Glocester sur une fausse piste. Un petit village de quelques âmes, en bordure de la forêt, en plein jour. Les villageois et villageoises, profitant du beau temps, partent aux champs. Margherita sort de la chaumière où elle se cache sous un déguisement. Elle repense aux récents événements mais retourne à l’intérieur à l’approche d’un soldat remarqué par les Highlanders. Isaura se présente devant Margherita et lui révèle sa véritable identité en lui remettant la confession de Lavarenne. Bien que choquée, la souveraine a la sagesse de comprendre combien Isaura est attachée à Lavarenne. Intérieur d’une tente, comme à l’acte I. Lavarenne sait qu’il doit choisir entre les deux femmes qui occupent sa vie. Malgré son profond attachement à Margherita, son amour pour Isaura s’avère toujours aussi fort. Intérieur villageois. Michele, désormais chargé de préparer les repas, demande à Carlo d’aller voir qui tambourine à la porte. C’est le duc de Glocester, Richard, toujours à la recherche de Margherita et de son fils. Il interroge Michele et, soupçonneux, exige de voir la « femme » de celui-ci. Margherita se présente et Glocester, qui la reconnaît, essaie de s’emparer d’elle. Lavarenne, à la tête d’un détachement de soldats français, fait alors son apparition. Glocester empoigne le fils de Margherita en menaçant de le tuer pour pouvoir s’enfuir. Michele, qui a réussi entretemps à s’éclipser, revient accompagné de quelques Highlanders qui désarment Glocester. Au village, comme précédemment. Bellapunta félicite ses officiers de leur victoire. Michele tente à nouveau de rassurer Isaura en lui disant que Lavarenne lui reviendra. Isaura en doute. C’est alors que Margherita fait son entrée et lui rend le duc. Lavarenne demande pardon à sa femme qui ne cache pas son bonheur et, au moment où s’achève l’opéra, les époux se trouvent enfin réunis.